It is that time of year again: Free Comic Book Day (FCBD). As you will remember from my post last year, this day means a lot to me as it reunited me with the wonderful format that is comics. FCBD is held on the first Saturday in May every year. That means Saturday, May 7th is the day to get out to your local comic shop and pick up a one or two FCBD comics. This is my second year sharing my list of comics I hope to get my hands on. Last year, I curated a collection of offbeat, the unusual, indie comics, non-superhero comics, that caught my attention. This year, I am using the same criteria with an additional caveat - the comics must have an "All Ages" rating. However, I simply did not go through and pick out all comics with an all age rating. Instead, I read through and picked out those comics that appeal to me. Those compilations of short stories, teasers to upcoming graphic novel releases, and pop culture adaptations that will hopefully lead me to wanting more and jumping into the complete series. I must confess, Hilda (as in HILDA AND THE STONE FOREST ) and Lumberjanes (featured in BOOM! STUDIOS SUMMER BLAST:) are both favorites I am already following and highly recommend. Hilda is also the first time Nobrow Press has participated in FBCD and that alone solidified its place in my all-ages list. Their comics and graphic novels are some of my favorite in the last year and I hope to spread this news every chance I get. I am also featuring Bob's Burgers again, because out of all the pop culture based imprints, it wins again at catching my attention. 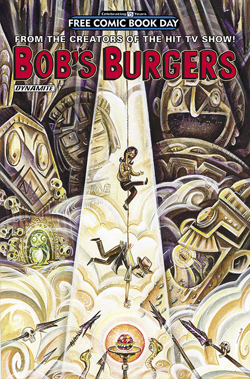 Scroll down to see full descriptions of my top six all-ages choices this FCBD. If you are looking to find which shops (or even libraries) are participating in your area, click here. You can also check out the full listing of comics on the FCBD site. Remember this is the day to pick up something you want to try, something you love, and something not run-of-the-mill. HILDA AND THE STONE FOREST : In the first Free Comic Book Day offering from Nobrow, the Eisner-nominated Luke Pearson tells the story of intrepid young Hilda's first adventure in the mysterious Stone Forest. Get ready for the body-swapping-est adventure this side of Freaky Friday! And keep your eyes peeled for Wiz and Mug, on their way to their next round of Fantasy Sports! 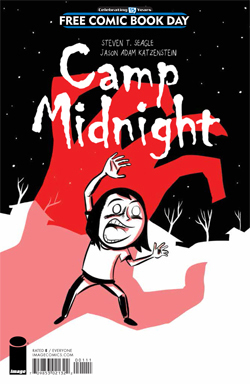 CAMP MIDNIGHT #1: Add a touch of spooky to your Free Comic Book Day this year with the first chapter of Ben 10 and Big Hero 6 creator Steven T. Seagle and New Yorker Magazine cartoonist Jason Adam Katzenstein's Camp Midnight! Not wanting to please her "step monster," reluctant Skye is dead-set on not fitting in. But when she's accidentally sent to the wrong summer camp - Camp Midnight, where everyone attending is a full-fledged monster - Skye realizes that not fitting in will be the very least of her challenges! Camp Midnightis the perfect book for readers who love Raina Telgemeier's Smile but wish it had more bowls of gooey eyeballs in the lunch scenes. MOONCOP: A TOM GAULD SAMPLER: Penned by the cartoonist of Goliath and You're All Just Jealous of My Jetpack, this FCBD offering features an exclusive excerpt from Tom Gauld's all-new graphic novel Mooncop, plus a selection of short humor strips. Mooncop details the deadpan day-to-day adventures of the last policeman on the colonized moon. Support good comics and see why Tom Gauld has regular comics in the Guardian, New York Times and the New Yorker! It's simple: he's brilliant and funny. BOOM! STUDIOS SUMMER BLAST: In the BOOM! Studios 2016 Summer Blast, read all-new, original short stories of David Petersen's Mouse Guard and Jim Henson's Labyrinth. Plus, get sneak peeks of the upcoming new Adventure Time: Comicsseries, the Lumberjanes: Don't Axe, Don't Tale special, and this summer's highly anticipated original graphic novel from Archaia, The Cloud. As a bonus, we've included preview pages from Goldie Vance, our newest BOOM! Box debut. There's something in this Free Comic Book Day issue for everyone!